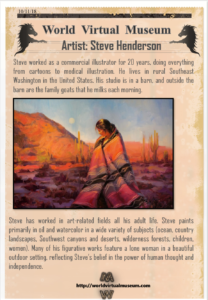 Steve worked as a commercial illustrator for 20 years, doing everything from cartoons to medical illustration. He lives in rural Southeast Washington in the United States. His studio is in a barn, and outside the barn are the family goats that he milks each morning. 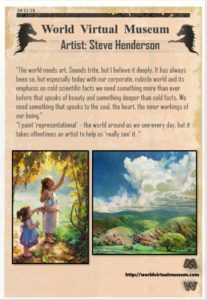 Steve has worked in art-related fields all his adult life. 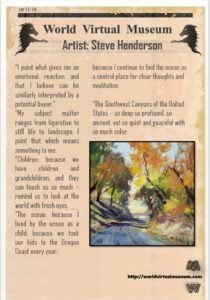 Steve paints primarily in oil and watercolor in a wide variety of subjects (ocean, country landscapes, Southwest canyons and deserts, wilderness forests, children, women). 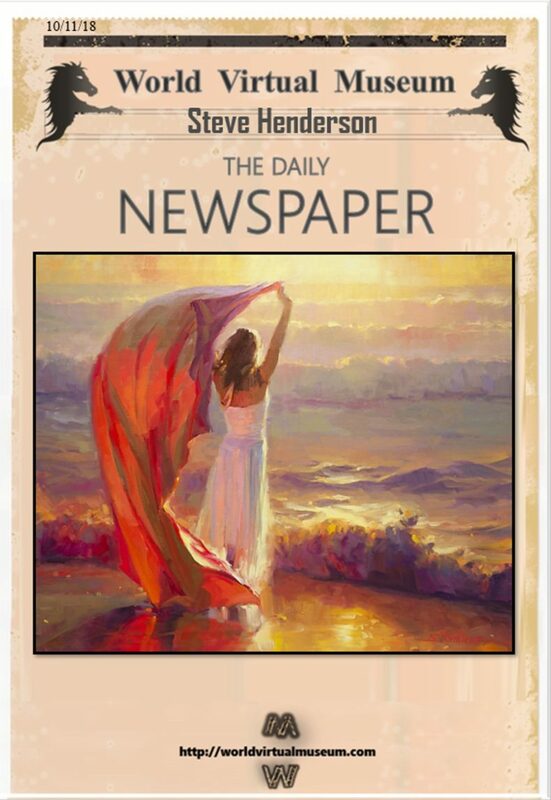 Many of his figurative works feature a lone woman in a beautiful outdoor setting, reflecting Steve’s belief in the power of human thought and independence. “Children: because we have children and grandchildren, and they can teach us so much – remind us to look at the world with fresh eyes. because I continue to find the ocean as a central place for clear thoughts and meditation. “The Southwest Canyons of the United States – so deep so profound, so ancient, yet so quiet and peaceful with so much color. 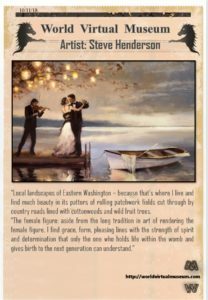 “Local landscapes of Eastern Washington – because that’s where I live and find much beauty in its patters of rolling patchwork fields cut through by country roads lined with cottonwoods and wild fruit trees. “We know the piano player requires years of intense practice. Steve has a B.A. 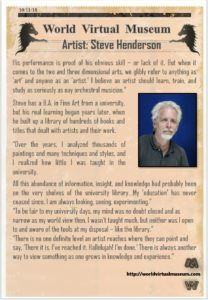 in Fine Art from a university, but his real learning began years later, when he built up a library of hundreds of books and titles that dealt with artists and their work. “Over the years, I analyzed thousands of paintings and many techniques and styles, and I realized how little I was taught in the university.